Testing of products for use in contact with drinking water. Cold-formed, electric resistance-welded, carbon steel hollow sections used for structural purposes. Seamless and welded ferritic/martensitic stainless steel tubing for general service (general corrosion-resisting and high-temperature service). Seamless and welded austenitic stainless steel tubing for general service (general corrosion-resisting and low- or high-temperature service). Seamless and welded austenitic stainless steel pipes for high-temperature and general corrosive service. Plain end seamless and electric-resistance-welded steel pipe for high-pressure pipe-type "cable circuits"
Extruded Polyolefin Coatings for the Exterior of Steel Water Pipelines. Glossary of terms relating to black tea Defines over 200 English terms (and equivalents in French) applicable to dry leaf, liquor, infused leaf and methods of manufacture. Fire behaviour of building materials and building components. General purpose seamless circular stainless steel tubes - technical delivery conditions (construction , food, . pharmaceutical, automobile, decorative purposes). Seamless circular austenitic stainless steel tubes subject to special requirements - technical delivery conditions (pressure vessel, chemical plant, pipe works). Code for construction and acceptance of industrial metallic piping. Electrowelded and seamless steel tubes for automotive and bicycle industries. Steel bent closed welded square and rectangular section for building. Specifications. Steel welded pipes for trunk gas pipelines. oil pipelines and oil products pipelines. Tubos de acero al carbono con costura para uso estructural. Rolled Steels for Welded Structure. Mechanical Properties. Steel Tubes - External Coating With Three Polypropylene Layers Coating - Application By Extrusion. Steel tubes. Welded austenitic stainless and austenitic ferritic steel rolled tubes for pressure service - dimensions - technical delivery conditions. Steel tubes. 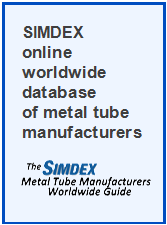 Longitudinally pressure welded tubes from non alloy and ferritic alloy steels for heat exchangers in diameters from 15,9 mm and 76,1 mm inclusive - dimensions - technical delivery conditions. Steel tubes - welded steel tubes with improved machinability for mechanical machined parts - dimensions - dechnical delivery requirements. Steel tubes - round, square and rectangular precision steel tubes longitudinally induction welded from hot or cold-rolled flat products, coated or not coated - dimensions - technical delivery conditions. Steel tubes. External coating with three polyethylene based coating. Application through extrusion. Electric resistance-welded carbon steel tubes for low-pressure boilers. Weldable steel wire rod in coils suitable for cold drawing or rolling for the production of reinforcing steel wire (mesh quality). Material according to the standard ASTM A 510M SAE 1010. Unalloyed medium carbon steel. AISI 1040 is a medium strength steel with good tensile strength. Suitable for shafts, stressed pins, studs, keys etc. Low-alloy steel containing chromium and molybdenum as strengthening agents. Welded steel pipe for general structure. Seamless copper tubes of circular section for genaral purposes. Electric-welded steel pipe for use in tubing manufacture. Electric-welded steel tubing and couplings for gas and gas- condensate wells. Electric-welded steel casing and couplings. Casing pipes with the buttress thread of extended precision for casing of oil wells. Drill pipes with prior mounted joints and couplings. Copper pipe with low content of carbon residues, insulated with Ebrille foamed polyethylene obtained by extrusion using environmentally harmless gases. Steel structures - instructions of design, construction, testing and maintenance.